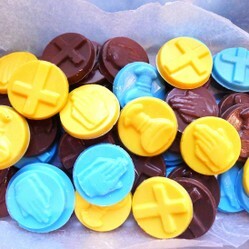 Create delicious and fun chocolate party favors an/or cupcake toppers using specialty molds. For my son's First Holy Communion a few weeks ago I decided to make chocolates. I had come across these chocolate molds and candy melts so many times online and at my local craft store, but had never bought them before. They looked easy so I figured I would give them a try! To my surprise the chocolate melts and molds were super simple to use. Sometimes things that look easy actually aren't. Therefore, I was happy to find out that was not the case with my latest kitchen creation. These chocolates would be great for a birthday party, baby shower, bridal shower, party favors, cupcake toppers, Communions, Baptisms and more. If you are planning on making chocolates for your next celebration, there is a huge selection of candy molds on the market. *Note: The mold I used was a candy mint mold, therefore, the chocolate did not take very long to set since they are fairly thin. If you are using a deeper or larger candy mold, it may take longer for the chocolate to completely set. Have you ever used Wilton candy melts? No, but I have used Merckens chocolate melts. I have never melted chocolate before. These chocolates can be used as party favors. Simply place them in FDA approved bags and tie with coordinating colored ribbon. However, I decided to use these chocolates as cupcake toppers. I think they came out so cute. I baked and frosted the cupcakes. Then, placed one chocolate on each cupcake. Our chocolates and cupcakes were yellow, blue and brown. The yellow and blue matched our Communion plates and other partyware. I placed the cupcakes on a clear plastic serving platter and added a few extra chocolates around the cupcakes. Everyone enjoyed the cupcakes with chocolates! I can't wait to make them again for another special occasion. Great recipe. I will definitely make some for my family and friends. I'm diabetic so I would have to eat wisely. Today we discuss the topic of decadent high end chocolates. Find out how to get your hands on the best quality chocolates for the best prices. Get great deals on chocolate now.